It would be very helpful if you were to put the actual values that Zencart uses into the ecommerce code you have listed. I didn’t get the Analytics module to work for ecommerce, so I ended up going into my database to find the correct id’s for the code and then inserting the code into a footer banner. Are you using the Simple Google Analytics Contribution? If you are, then e-commerce tracking is already installed with it. Glad that you have found success by implementing my continued suggestions on this site. I only post what I have already tested and have found to work. I’m constantly testing and re-testing new options. As I find those that work, I like to let others know. So do we just enter this code without any modifications? Or do we need to alter it to fit our set up? Also, based on your comment above, we also need to edit the main page and header template file? I thought it was just the checkout_confirmation page that got this e-commerce tracking code. I have edited this post and updated it with the code you should use if you are manually inserting e-commerce tracking into Zen Cart. Keep in mind that if you are using the Simple Google Analytics module for Zen Cart, you should not have to insert code by hand at all to install e-commerce tracking. That is automatically done for you when you install the module. Thank you for your wonderful help! It’s really helpful, especially if you are a new Zenner like me. Does the solution provided on Zen forum achieve the same results? It looks similar, however, since I have never used that exact code, in the places they mentioned, I can’t for sure say. I can say that that solution does not include Conversion Tracking. The Simple Google Analytics module works just fine on 1.3.7 (I’m using it on a few sites running 1.3.7 right now). Anything over 1.3.6 it works with. I even think it works on 1.3.5. Also the latest download (1.1.1) from the Zen Cart site does not have the files already modified so I had to do the manually config instructions. My current version of ZC (1.2.6 I believe) did not have $zv_order_total_cd = $orders->fields[’order_total’]; or the other type of code. You may want to say you need to copy and paste this line (if you do not have it) at the beginning of the instructions instead of the end. On December 13 2007, Google updated Analytics to use ga.js instead of using urchin.js. See the following post: Google Analytics ga.js. How does this affect integration of ecommerce tracking for Zen Cart? Google shows a way to do this manually for any shopping cart system: http://www.google.com/support/googleanalytics/bin/answer.py?hl=en&answer=55528, but it seems there should be a plugin out there that would make integration with ZenCart even simpler. For Zen Cart, I have already developed the updated plug-in using that replaces the “urchin” code with the updated “ga” code. It is set for release here later today or tomorrow. Do you know if the tracker can recieve null data and still work? Why would you ever see a “null” transaction? If you sold a product, the transaction should include the data relating to that product. I see. You’ll have a tough time getting accurate results for ecommerce without a unique product id. Entering arbitrary info into that field won’t do a whole lot of good either unless, that information remains consistent and does not interfere with a later “arbitrary” number. If your current ecommerce engine doesn’t track order id numbers, then how do you keep track of orders? What’s to prevent one from interfering with another? I would take a careful look at your current ecommerce system if it does not track order ids. if you plan on expanding and growing, that could cause a problem in the future. Thanks Eric… just a follow up. I am still not getting any data in the reports at all. Accurate or not there is nothing coming through for the E-Commerce content. Is there anything wrong with what you see above that could indicate such a lack of content? 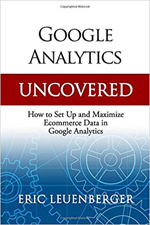 With the exception of the initial “transaction” id, the code above looks ok.
Have you turned on E-Commerce tracking for your Google Analytics Profile? If you haven’t done that yet, then it won’t track ecom data no matter how good the tracking code is? Hi, could we know the navigation information before the transaction? I mean for each transaction, could we know the pages been visited before the purchases and the average time spent? This is what is called the “click path”. There are analytics systems that allow you to look at this but currently Google Analytics doesn’t have an effect method of doing so. IndexTools did a great job of this. They have been purchased by Yahoo! and it looks like they still have this ability. I’ve tried your google analytics contribution and then tried hand code since some of the files seem to be in different directories (I’ve inherited this Zen store and am still learning about Zen Cart). Everything is showing up zeros at google and I’m getting this error message at the base of my success page. What am I missing?? It sounds like something else was altered when you tried to install this mod. It should have no issues as such that I am aware of (or that any others have reported). I’ve installed the simple google mod, and the analytics are working great, but the conversion tracking is not registered. The option to input my conversion tracking number shows up, so I think the mod is installed correctly, but I’m getting no conversions on my adwords account. I’m got it turned on correctly and it is receiving data. Is there anything I need to do besides input my conversion tracking number into the option field in zen cart? You need to make sure you are using the right tracking number (different from the analytics number and found within your Adwords account.) Conversion tracking is used in conjunction with Adwords / Paid Search data. If you have the right conversion tracking number and you have turned on conversion tracking from within your Adwords account, you should see numbers. I installed the “Simple” code and conversion stats works great, but unfortunately, my “normal” Google Analytics stats have doubled. I took a look at source of my homepage, and the Google Analytics code is twice in it… (see below). I installed a Simple mode code through admin section, so how (and from which file) can I now delete the repeating part of the code? You’ll need to remove one of those in order for it not to double track stats. The most common cause of this double tracking issue within zen cart is that someone manually entered the analytics code on pages of the site (footer, etc…) and when you installed the Simple Google Analytics module you did not delete that previously hand added code. Delete that previous reference to GA and leave the Simple GA module running and you should see normal stats again.